There are so many good reasons to visit Senigallia, a stunning and super-relaxed beach town in the heart of Marche in Central Italy. 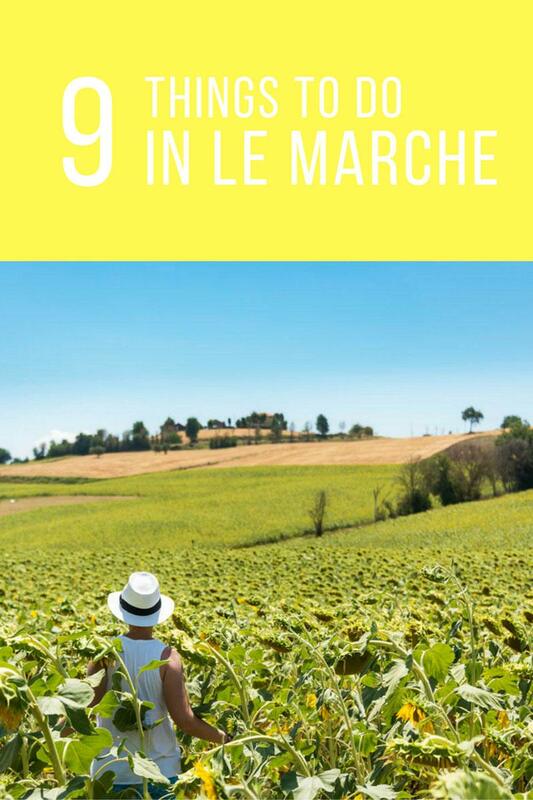 By the way, if you want to know more about Marche (and get a serious case of wanderlust in the meantime), check out our Marche in 12 Instagrams post! Part of Italy’s beauty lies in its diversity – from the green mountains of South Tyrol to the sun-drenched alleyways of Sicily and the metropolitan buzz of Milan, I’m always at a loss when I’m asked to identify quintessentially ‘Italian’ places. 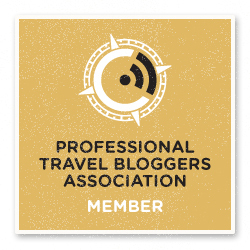 And I’m even more at a loss when I need to recommend places that are ‘authentic’ and ‘tourist free’ at the same time. Then we visited Marche. A region with a big, green-blue heart. 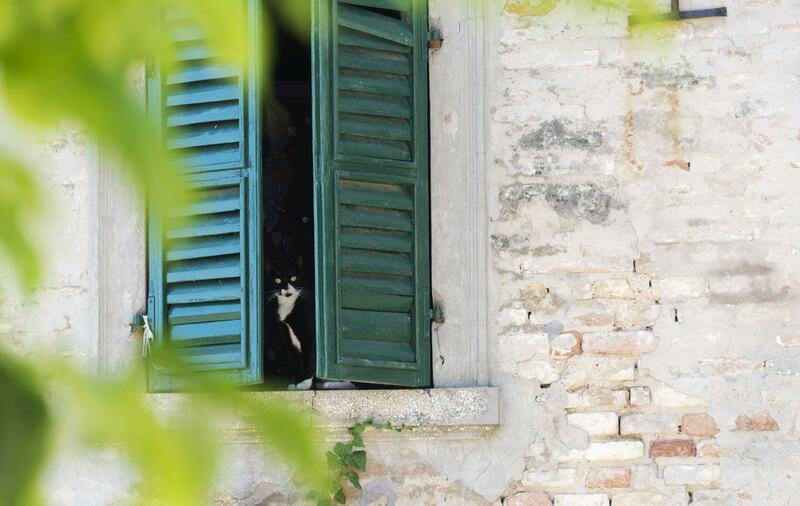 Where you can follow cats meandering around walled villages. Where you can go hiking or caving, and end your day with a sunset swim on some of Italy’s best beaches. A place where lunch turns into aperitivo and then into dinner – because you simply can’t stop enjoying all that delicious food and wine. 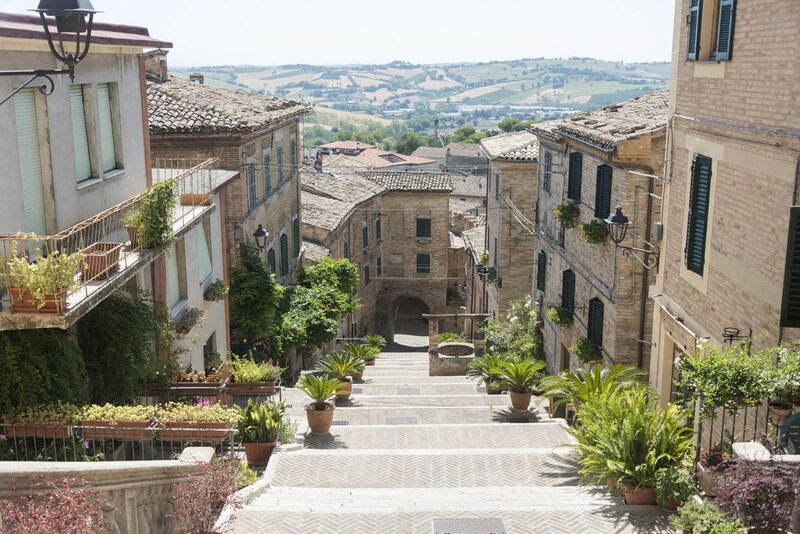 Most importantly, Marche will win you over with the friendliness of its locals and its top-class service – and it’s not as touristy as neighbouring regions, meaning it’s not so hard to visit Marche on a budget. 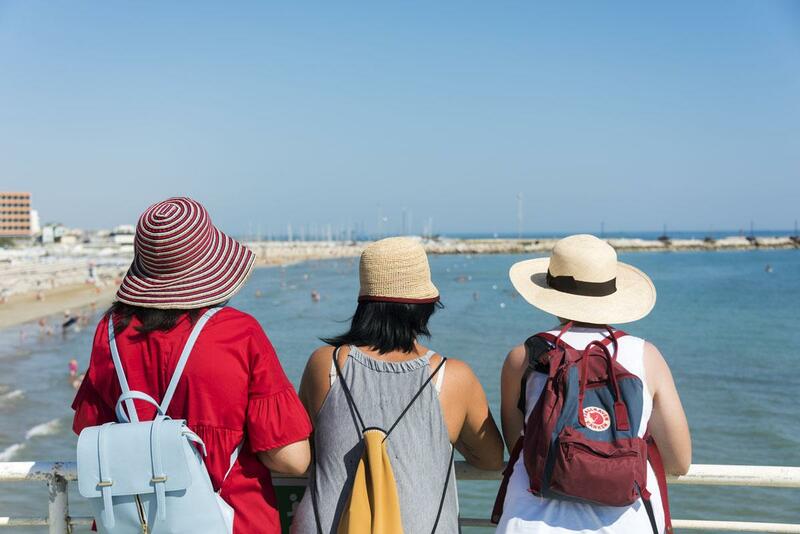 There’s no better place to experience Marche hospitality than visiting Senigallia, the region’s premiere seaside resort. Wide sandy beaches, clear sea and lots of summer events, including the top swing & rock’n roll festival in Europe – honestly, what’s not to like? Yet, visit Senigallia, and you’ll see there’s a lot more then just beaches – the town has plenty to keep you busy on a rainy day. You can visit well-preserved Renaissance palazzos, fresco-covered churches and archaeological sites, cycle all over town, enjoy the best ice cream in Italy or just fill your face with delicious seafood and white wine. If the bustle of the coast all gets a bit too much, just drive off to the hills and get lost between sunflower fields and cobbled alleyways, and enjoy silence in the midday heat. After our recent three-day visit to Senigallia and surrounds, we’ve compiled this list of things to do and see when you visit Senigallia – including a very special day trip. 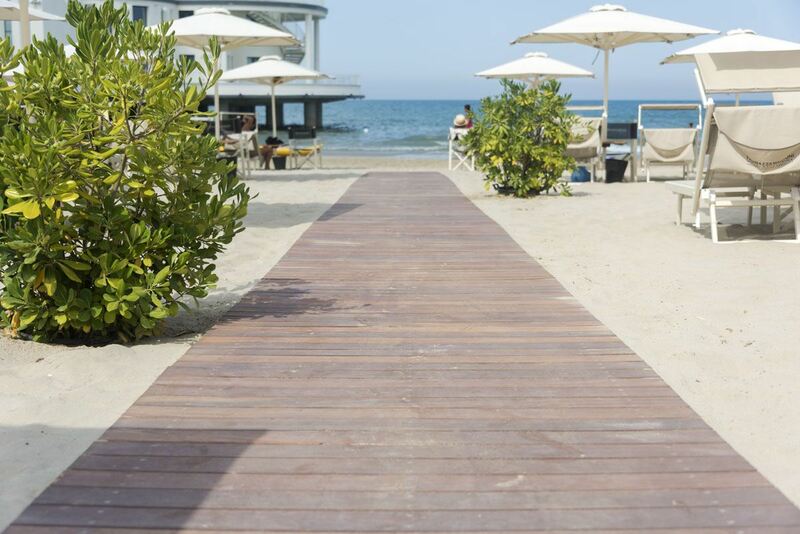 As you’ll see, it’s not just about the beach – even though Senigallia beach is very special indeed! 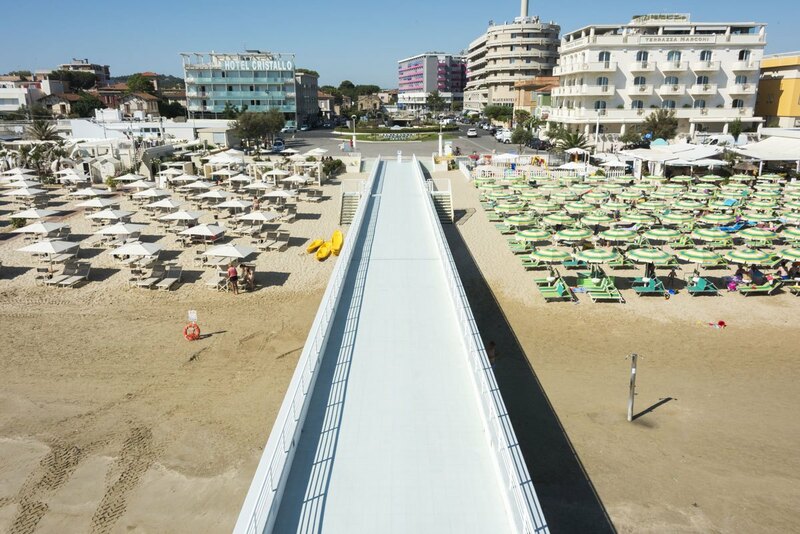 Senigallia is famous for its spiaggia di velluto, meaning ‘velvet beach’ – 13 kilometres of fine golden sand, leading up to the aquamarine waters of the Adriatic Sea. The sea is always calm, and the sandy bottom has a gentle gradient, making it ideal for families and less-comfortable swimmers. 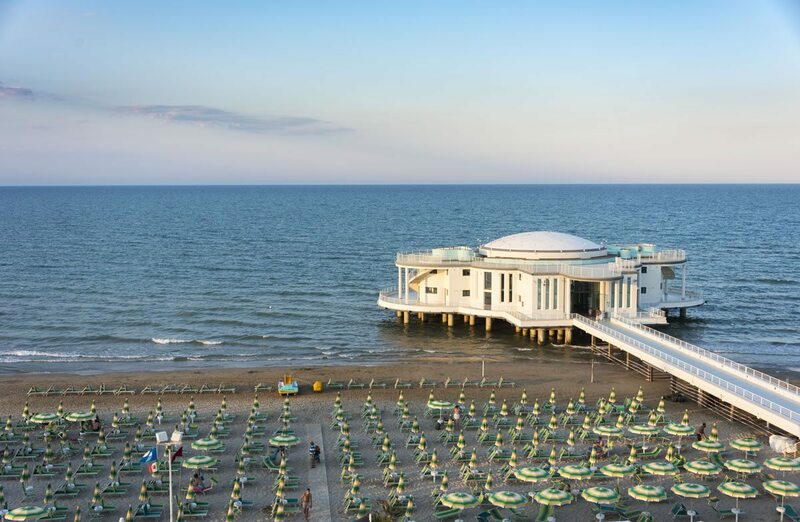 In true Italian style, the bulk of Senigallia’s beach is taken up by bagni, beach clubs with umbrellas, sun loungers and – sometimes – even a seaside spa. 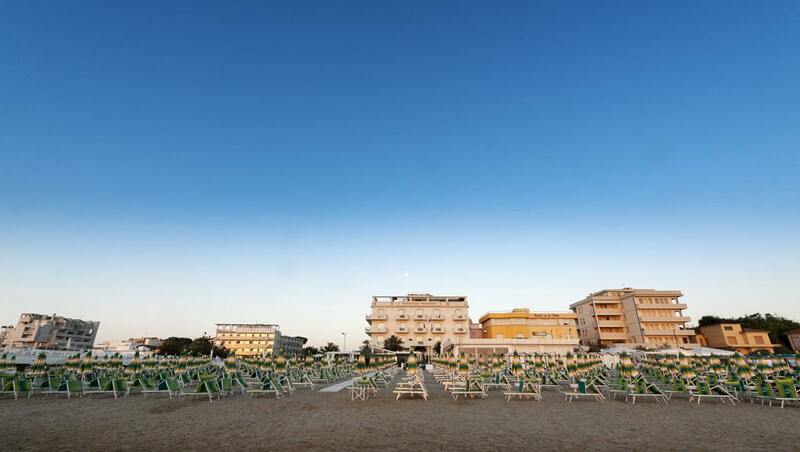 We stayed at Terrazza Marconi, where access to a beach club right across the road is included in the price of all rooms, alongside fluffy beach towels and chilled water. 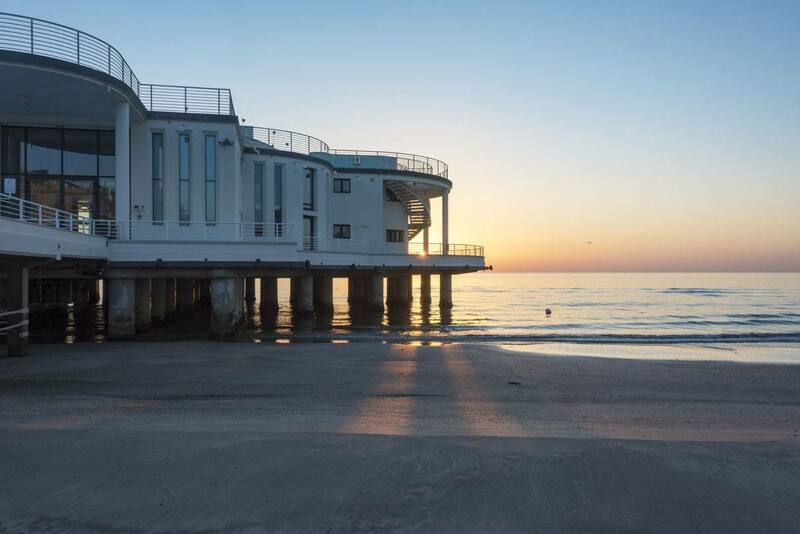 On top of that, Senigallia beach is Blue Flag certified – an international eco label given to seaside location that respect a stringent series of environmental, educational and accessibility criteria. 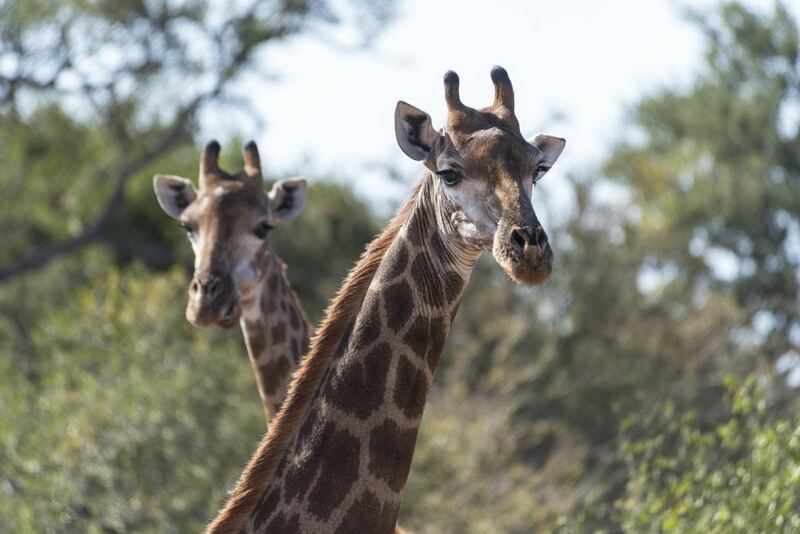 All the more reason to visit! 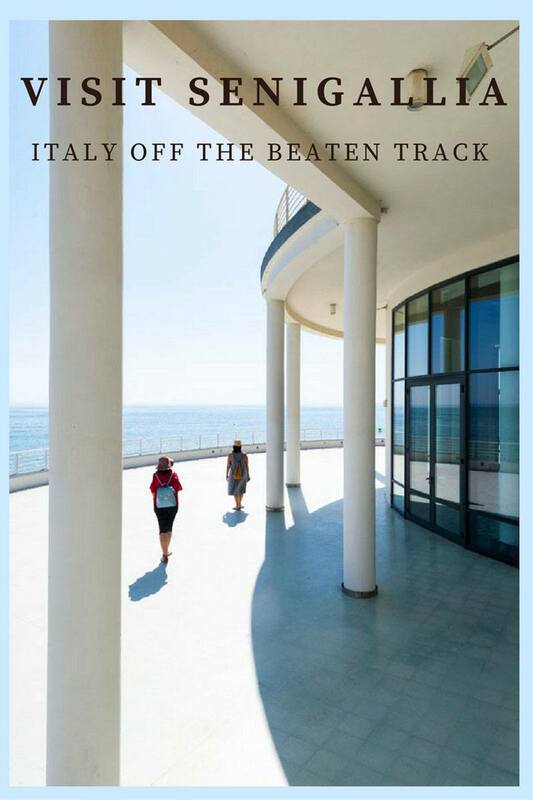 Ask any Italian what Senigallia is famous for, and the answer will be la Rotonda, of course! 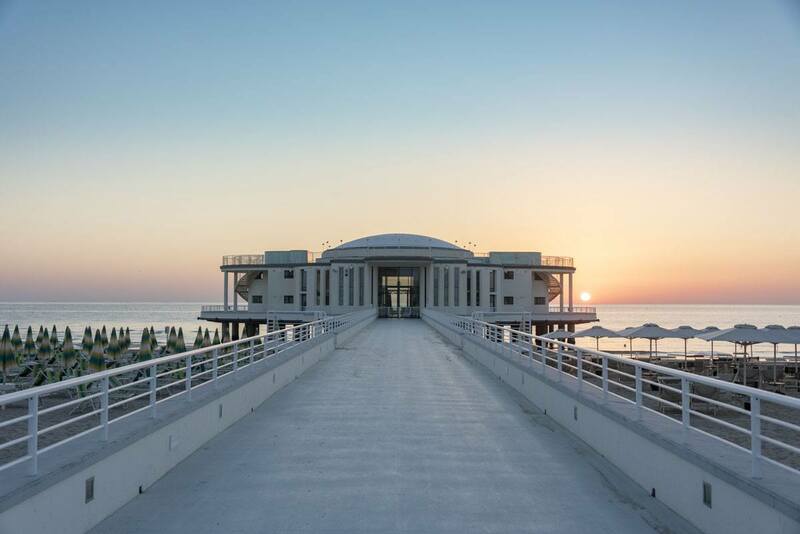 The Rotonda a Mare is Senigallia’s most famous tourist attraction, a pier with a round-shaped pavilion at its end, built over the sea. The Rotonda was erected in the 1930s, and throughout the years it was used as a ballroom, restaurant, conference hall and wedding location. 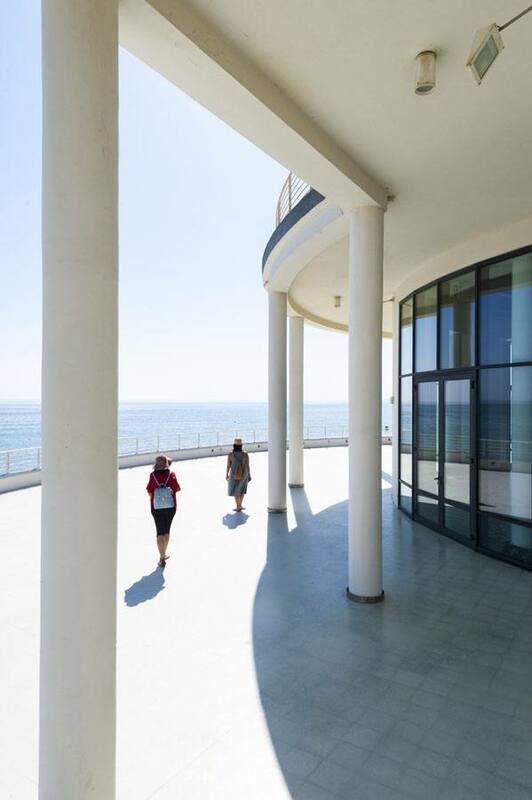 The Rotonda can be visited for free every day in summer between 6 pm and midnight – the pavilion is empty save when it is used for pop-up dinners or other events, but it’s still worth a visit for its wonderful views over the Adriatic and for its unique architecture. Senigallia is also famous for its summer festivals – first and foremost is Summer Jamboree, a two-week swing, rock and roll and lindy hop extravaganza, dedicated to American culture and music in the 1940s and 50s. This year the Summer Jamboree takes place between July 26th and August 6th and it includes 46 free concerts, dance classes, burlesque shows, a vintage market and street food. Another popular summer festival in Senigallia is Deejay Xmasters, a free event dedicated to music and extreme sports. It’s on from July 15th to 23rd this year, with performances by pro athletes and opportunity to try activities like flyboard, parkour, kitesurfing and aerial dancing. 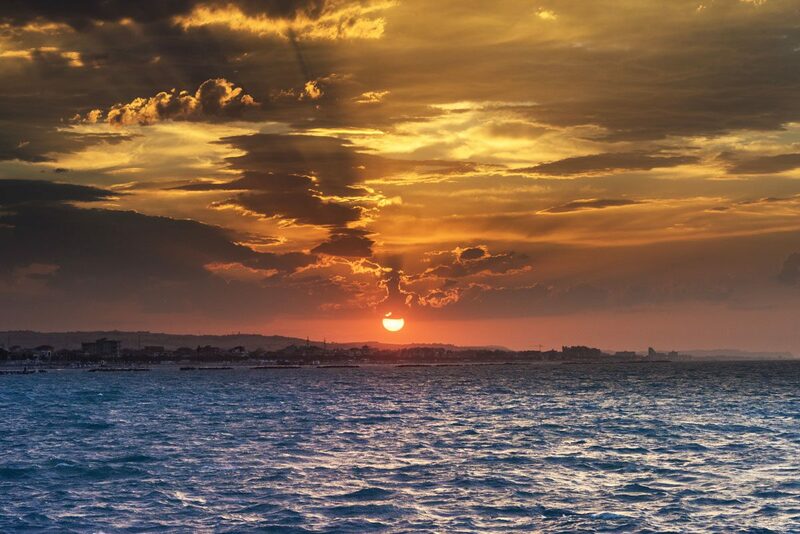 All along the Adriatic, the sun rises from the sea – now, I’m not an early riser by any means, but if you come to Senigallia, I strongly recommend waking up early to watch the sunrise in summer. The sun rises around 5.30 in July, and it’s one of the rare moments when you can experience this buzzing seaside town in total peace and quiet. 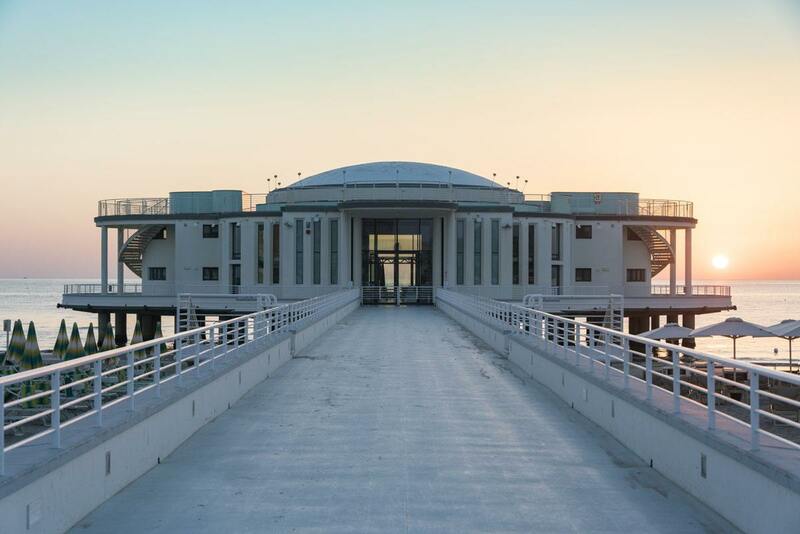 The Rotonda is the perfect location to watch the sunrise – as you can see, the sun rises just behind it, creating a brilliant photo opportunity. You’re more than likely to be alone, save for a few health junkies running along the beach. 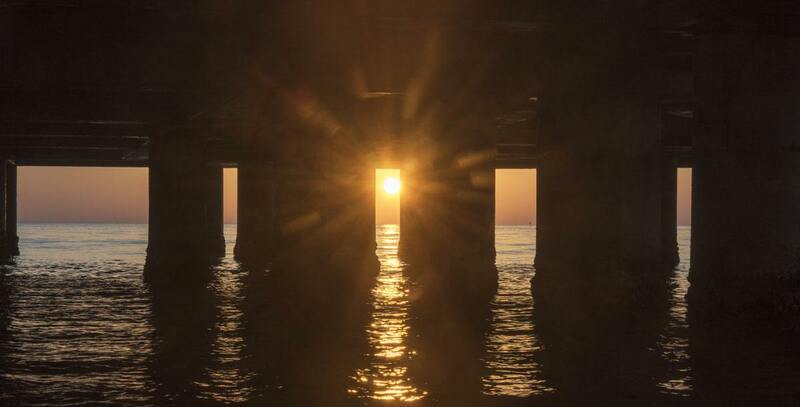 If you can’t quite make it in time for sunrise, sunset still makes for wonderful photo opps. 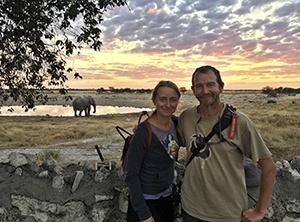 The sun sets approximately at 9 pm in July, and the rocks at the fare end of the port are the best location – as you can see from this image, the shape of the coast makes it look as if the sun is setting into the sea. 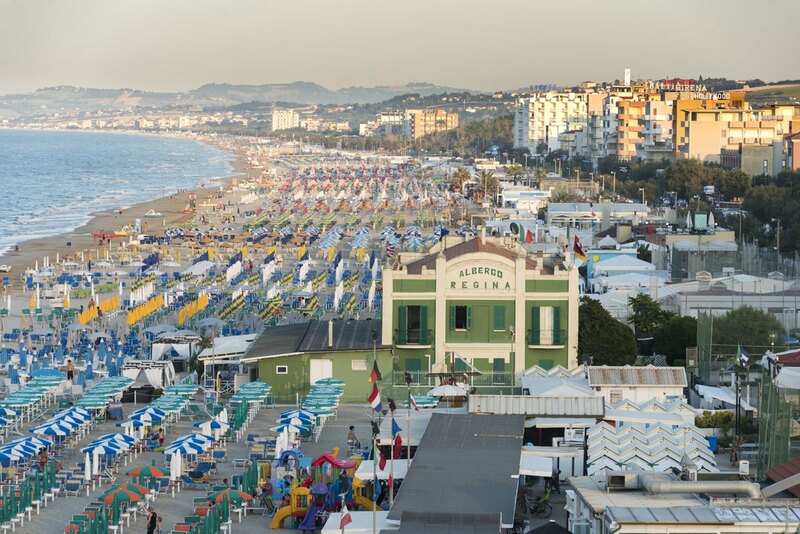 Unlike many seaside resorts developed over the last century, Senigallia has a history that stretches back millennia, having been settled by a Gallic tribe in pre-Roman times. A walk around the historic center is a great way to spend an afternoon away from the beach, or you can turn this history outing into a full day activity if you so wish. Start with a visit of the Area Archeologica Fenice, located under the theatre of the same name, where you’ll be able to discover the remains of Sena Gallica, the Roman nucleus of the city. 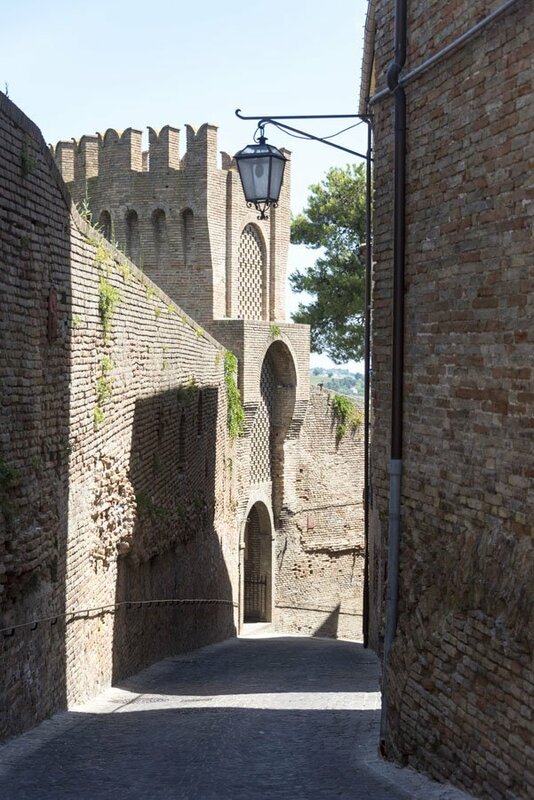 Crossing the historic centre, you’ll no doubt notice the huge Rocca Roveresca, a fortified castle that was also the ancestral home of the Della Rovere, the family that ruled Senigallia in Renaissance times. 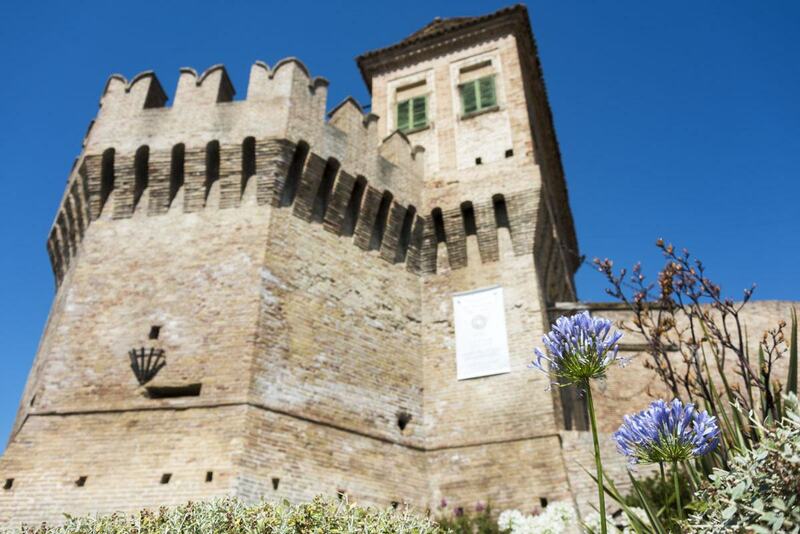 The rocca can be visited and it is now used as a location for art exhibitions. In the 18th century, Senigallia was at the centre of the flourishing Adriatic trade, and it hosted a trade fair that contributed to the development of the city. Senigallia points of interest dating back to this time include the Portici Ercolani, a row of covered porticos built along one of the banks of the Misa River that flows into the port. 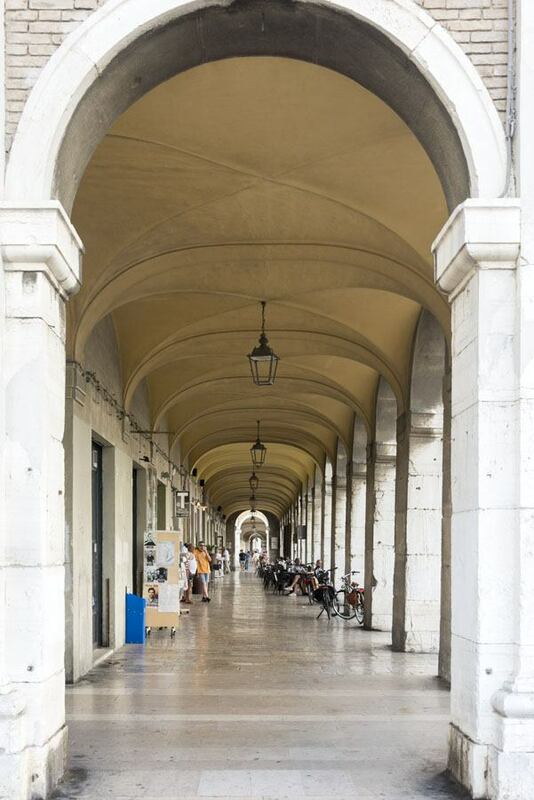 The Portici were built to serve as a covered arcade for the trade fair, and a second row of porticos was meant to be built on the opposite bank, but then the fair was hit by a crisis and the project was dropped. Another interesting sight is the Foro Annonario, a neoclassical round square surrounded by porticos that is still the location for the daily fruit and veg market. Wandering around Senigallia you’ll also find examples of Fascist architecture, erected after the city was damaged by an earthquake in 1930. 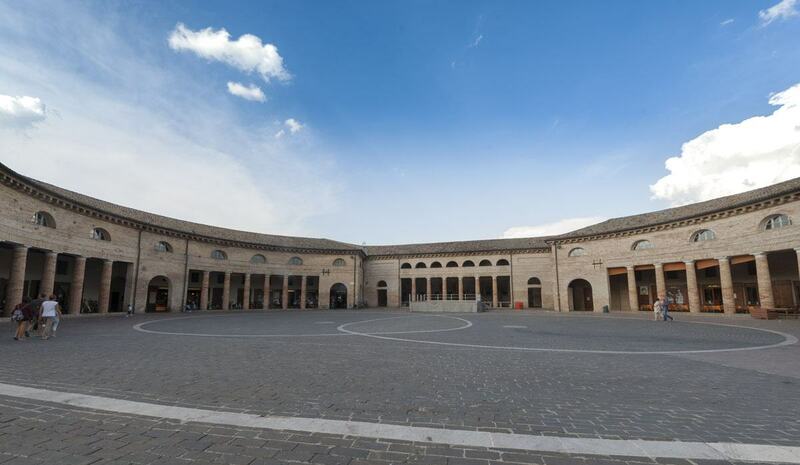 The Rotonda is one example – other buildings include the Scuola Elementare Pascoli and the recently-restored Casa del Balilla. As you can see, there are many things to do in Senigallia away from the beach – however, if you only had time for one Senigallia tourist attraction, I’d choose Palazzetto Baviera, a Renaissance palazzo located just around the corner from Rocca Roveresca – looking unassuming from the outside, absolutely breathtaking from the inside. The Palazzetto was home to the noble Baviera family, who clearly didn’t spare expenses when it was time to decorate the interiors – the ceilings of rooms on the upper floor were all decorated with exquisite stucco work by local artist Federico Brandani, who took over 5 years to complete this masterpiece. All this touring around the historic centre will no doubt make you hungry. Just across the Misa River from the porticoes you’ll find Via Carducci, heart of a once-seedy area now full of cute cafes and alfresco restaurants and gelato shops. 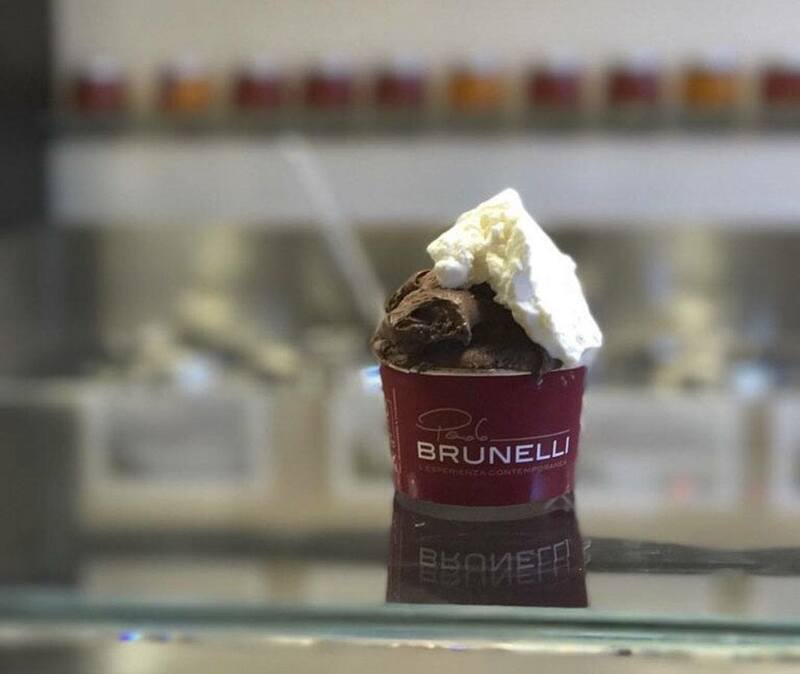 One of them is Gelateria Brunelli, awarded as the best chocolate icecream in Italy – of course you simply MUST try chocolate, perhaps accompanied by creative flavours like Portonovo with caramelised peanuts and chocolate. Trust me, you won’t go hungry when you visit Senigallia. 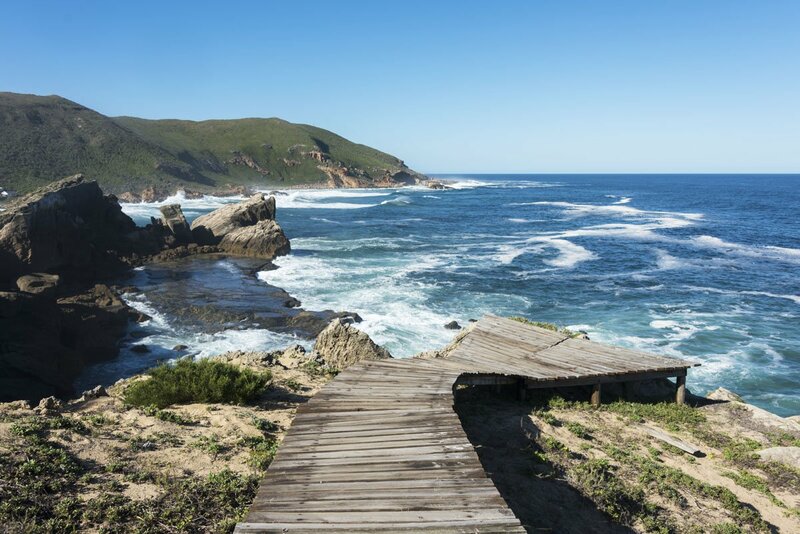 Whether you opt for a beachside dinner or choose one of the restaurants in the historic centre, good food and excellent service are pretty much guaranteed. 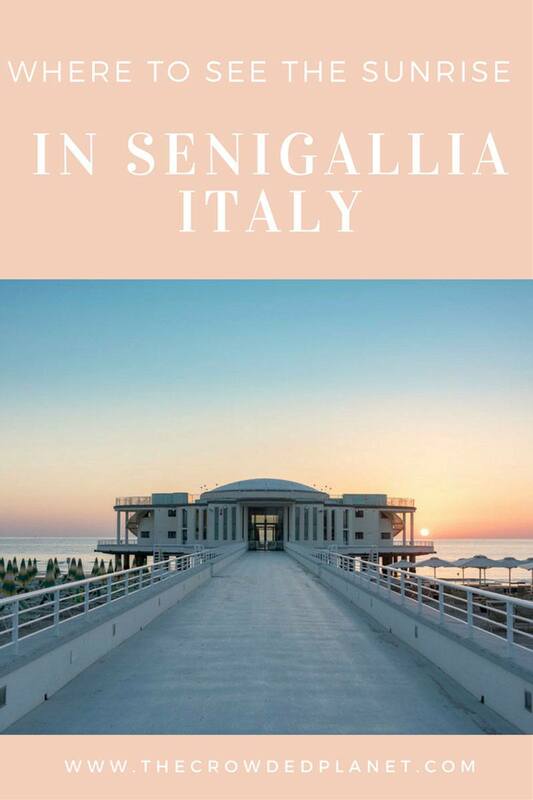 There’s nowhere more romantic than Senigallia’s lungomare for a lunch with sea view – we spent two full days in Senigallia and both days we went to L’Angolino sul Mare, a beachside restaurant located right opposite the Rotonda. 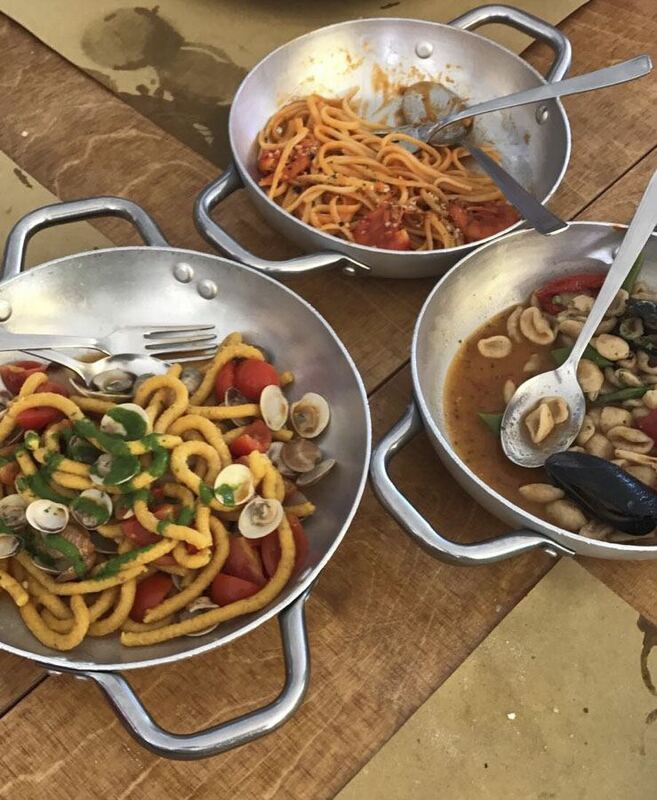 We had the chance to try several dishes, from traditional linguine ai frutti di mare (seafood pasta) and more creative pasta dishes like passatelli with clams and tomato (see below, on the right hand side). Another excellent seafood restaurant is La Pagaia, in a scenic harbour-side location. La Pagaia is slightly more upmarket and service is truly outstanding – if you get the chance, try their fritto misto, famous for being the best in Senigallia. 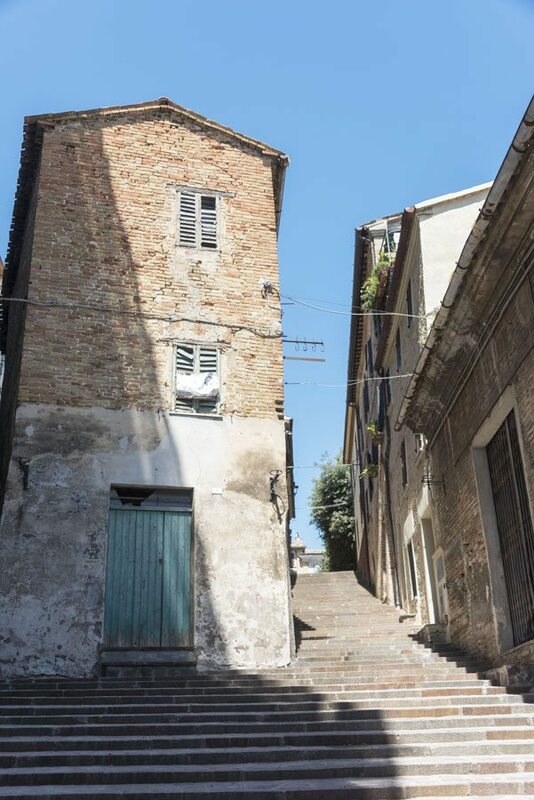 Fish rules supreme on Senigallia menus, but if you want to sample the flavours of the Marche hills, Rimante in the historic centre is a great option, with alfresco dining in a secluded alleyway. 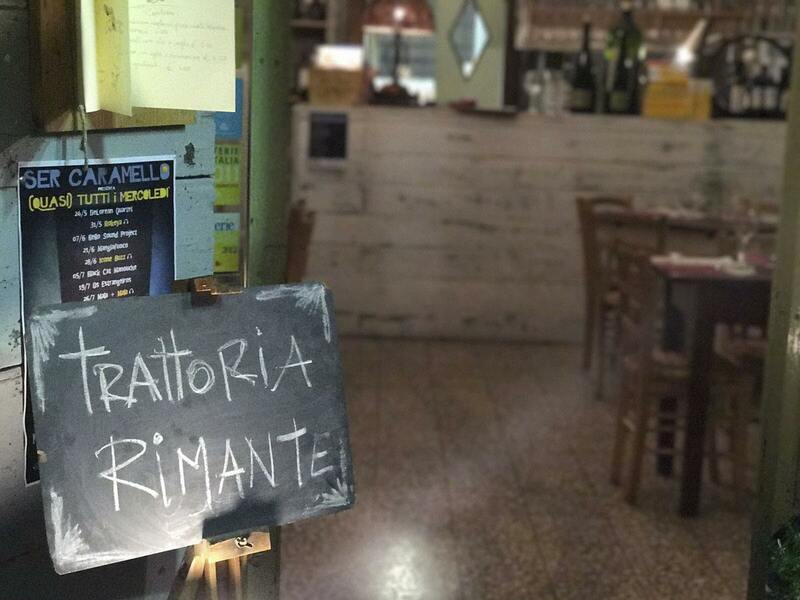 It was a very hot night, but we couldn’t help ordering some tasty meat-based dishes – a cold cuts platter, rabbit ‘porchetta style’, roasted goose (I know, that was a bit crazy) and the tastiest pasta cacio e pepe this side of Rome. If you fancy a quick trip away from the bustling atmosphere of Senigallia, Corinaldo is a great idea. 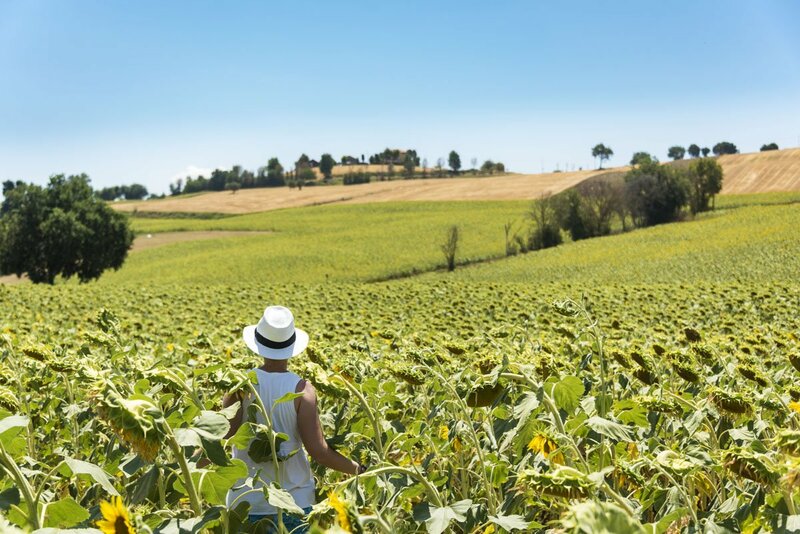 This pretty walled village is located in the hills just behind the coast, barely half an hour drive from Senigallia – and driving there is half the fun, surrounded by a hundred shades of green and sunflowers, with their heads bowed in the midday sun. We visited Corinaldo on a hot morning, and there was not a single soul out and about – save for a lone child chasing a football. Corinaldo is also known as il paese dei pazzi, meaning ‘the village of crazy people’, because of their quirky history and traditions. One of Corinaldo’s ‘crazy sights’ is the house of Scuretto, a local cobbler and wine lover. Scuretto’s son had moved to America in search of fortune in the early 20th century and sent money to his father every month – money that was always spent on wine and spirits. Suspicious that construction works were taking longer than usual, Scuretto’s son asked his father for a picture of the new home. Scuretto just built the façade, snapped a pic and headed straight to the pub – and when his son discovered the trick, the money ended and the rest of the house was never built. Another cool Corinaldo tale is that of the ‘polenta in the well’. Corinaldo is built on a hillside, and a 100-step stairwell connects its highest and lowest point. Once upon a time, a farmer was heading back from the fields with a corn sack on his back. He was tired from all those steps, so he leaned briefly on a well to rest – but the sack ended up into the well, and the farmer lowered himself down to try and save it. Here is where facts and myth intertwine – some say that the corn turned into polenta, and the legend of ‘polenta in the well’ began. Can you spot the ‘polenta well’? 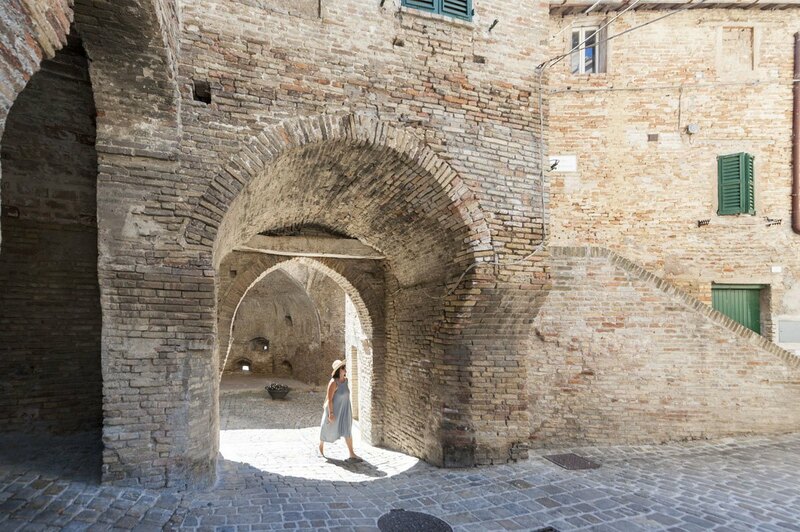 Besides stories and crazy traditions, Corinaldo is a delight to explore. Between narrow streets, panoramic towers and cascading bougainvillea photo lovers will be happy – and everyone will be glad to soak up the silence and admire the wonderful views over the hills, before heading back to Senigallia. 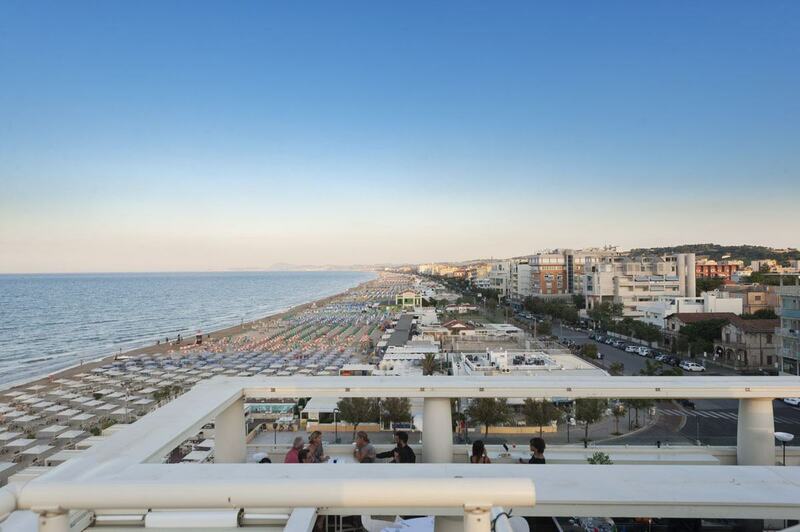 Our base in Senigallia was Terrazza Marconi Hotel & Spamarine, a four-star property located on Senigallia’s lungomare, just opposite the Rotonda. Rooms were comfortable and with all mod-cons, and we especially loved the fact that access to a beach club is included with all rooms. If you don’t fancy swimming in the Adriatic you can head to the Spamarine, a beachside spa with warm-water pool where six different kinds of water jets turn a simple seaside dip into a truly relaxing experience. There are also sun loungers, canopy beds and even the opportunity to enjoy a beach massage, with or without oils. Another great asset of Terrazza Marconi – which is kind of revealed in the name – is its wonderful rooftop terrace, perfect to enjoy breakfast with a view, a sunset aperitivo or a nightcap. You can also have dinner on the rooftop, and after having sampled aperitivo snacks, I’m pretty sure dinner would be delicious as well! 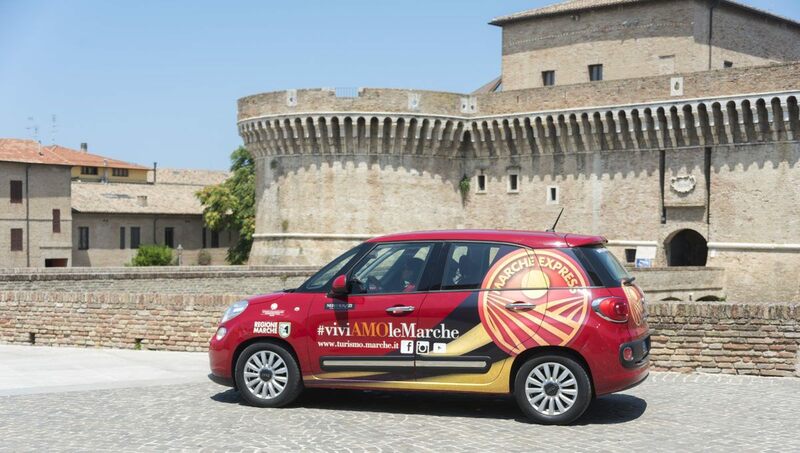 We would like to thank Confcommercio Marche Centrali, Marche Tourism, Feel Senigallia and Ilaria Barbotti for having invited us to join this trip. All views are my own. Watch our Senigallia & Corinaldo Video!